← Super Tuesday: No Girls Allowed! You’ve probably heard of “Six Degrees of Kevin Bacon” — the party game where you connect Kevin Bacon to other actors based on mutual film appearances. For instance, Kevin Bacon connects to Elvis Presley via Ed Asner, who appeared in films with both actors. 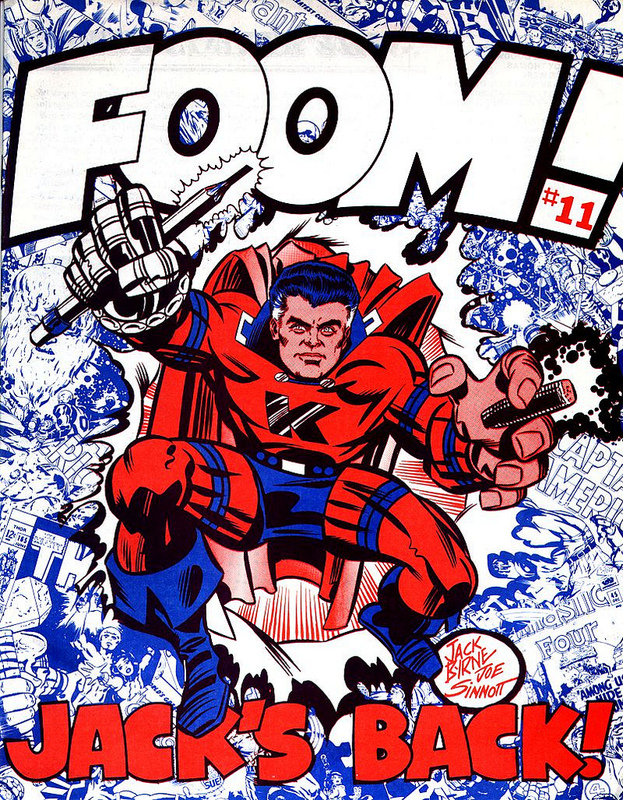 But really, we should be aiming higher than Kevin Bacon … and at the great Jack Kirby himself! After all, with Hollywood dominated by superhero properties that Jack helped to create — in movies like The Avengers, Captain America, Thor, and The Hulk — it’s clear that Jack isn’t just the King of Comics … he’s the King of Hollywood, too! Playing “Six Degrees of Jack Kirby” is easy — simply connect an actor or filmmaker to Jack Kirby in the fewest possible steps! Why not start with Kevin Bacon himself? Mr. Bacon played Sebastian Shaw in X-Men: First Class, and since Jack Kirby helped create the X-Men back in 1963, that means Kevin Bacon has one degree of separation from Jack Kirby! Kevin Bacon with January Jones as Emma Frost … which gives the entire cast of Mad Men a Kirby Number of 2! Joining Mr. Bacon with a “Kirby Number” of “One” is everyone else attached to some of the biggest movies of the last decade — names like Robert Downey Jr. and Scarlett Johansson (Avengers), Chris Evans (Captain America), Jessica Alba (Fantastic Four), Anthony Hopkins (Thor), Michael Fassbender (X-Men: First Class), and Tim Roth (Hulk). 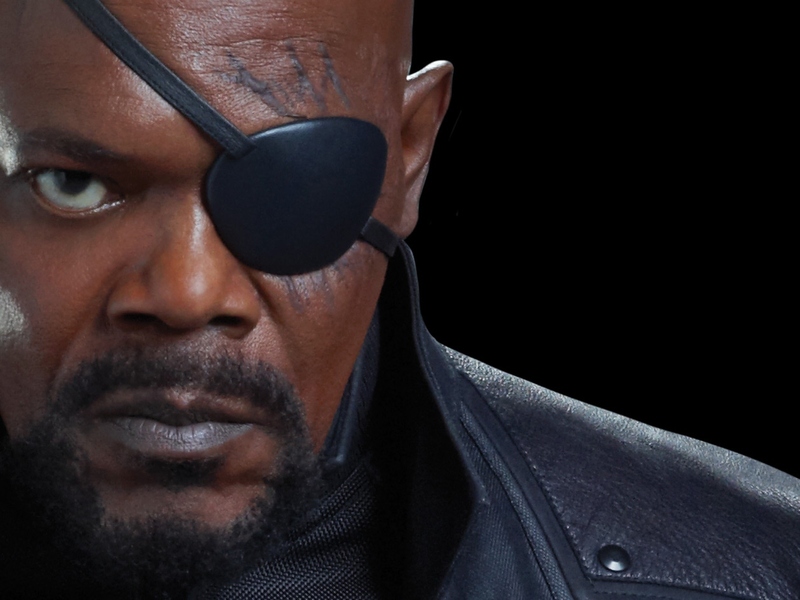 … Nick Fury, a character Jack Kirby helped create for Sgt. Fury and his Howling Commandos back in 1963! That means that Mr. Jackson has a Kirby Number of One! (And so does David Hasselhoff, but we’ll pretend that never happened). 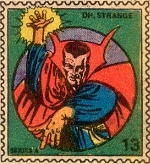 Some karmic geek symmetries appear at Kirby Number 3. 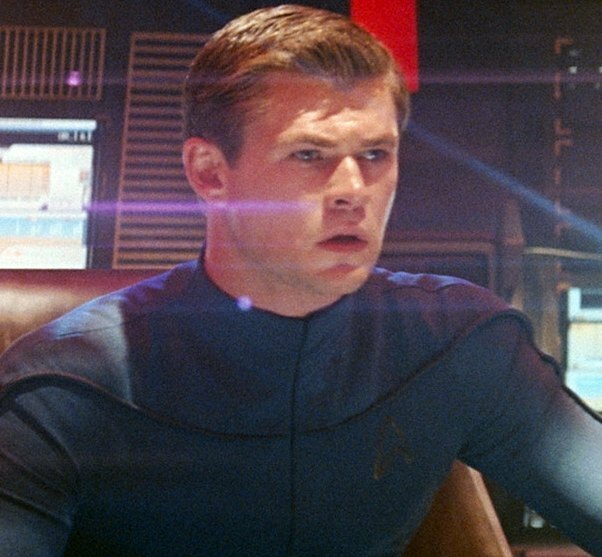 William Shatner is forever connected with Leonard Nimoy, who appeared in the J.J. Abrams reboot of Star Trek, where Thor’s Chris Hemsworth played George Kirk — Captain Kirk’s dad! Playing the bad guy in that same picture was Eric Bana, who played the Hulk … who worked with Sam Shepard on Black Hawk Down … who appeared in Days of Heaven for Terrence Malik … which also featured Rockford Files stalwart Stewart Margolin, who in 1968 appeared in a television program with teen heartthrob Davy Jones. 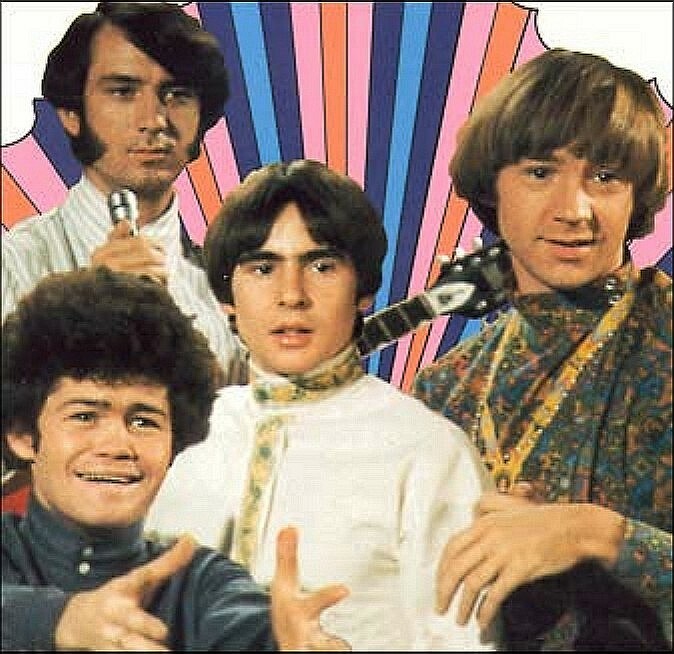 That’s right … Jack Kirby is just five degrees separated from The Monkees! considering Jack also brought us The Forever People, he’s probably closer to the Monkees than we suspect! Jack’s ripples aren’t confined to the realm of pop art, either. 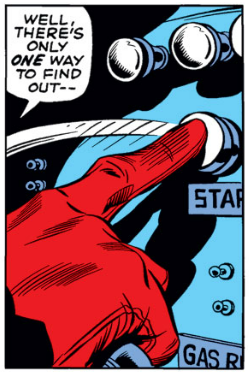 Lawrence Olivier has a Kirby Number of 2 (via Professor X — Patrick Stewart!). Orson Welles is a “three” (via Ian “Magneto” McKellan, through John Hurt in Scandal, who appeared with Welles in A Man For All Seasons). Marlon Brando is also a “three,” by way of appearing with Robert DeNiro in The Score, who is himself a “two” thanks to to his role in Sleepers opposite … Kevin Bacon (who is still pretty handy for stitching together these tortured threads). 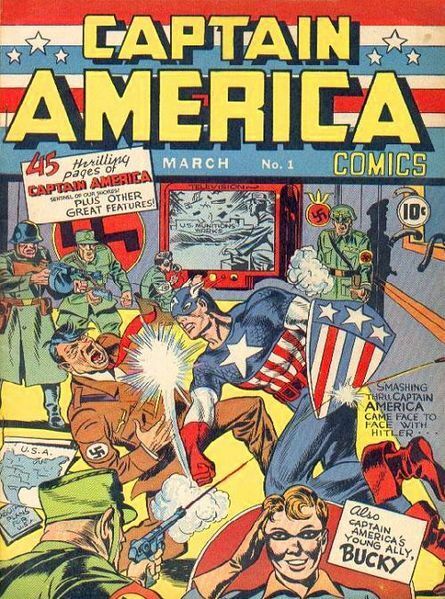 The realms of sports, religion, and politics connect to Jack Kirby, too — even Adolph Hitler deserves a Kirby Number of “One,” thanks to the cover of Captain America #1! OK, that was a bit silly … but it’s a short trip to silly when you work backwards from a base of work as broad as that of Jack “King” Kirby. Jack left us decades ago but his influence is still being felt. In fact, with movies like The Avengers working on it’s second billion dollars in box office, you could argue that Jack Kirby’s influence is greater today than ever before. All of which serves to underscore why I am still fascinated with comic heroes and their legendary creators here at Longbox Graveyard. 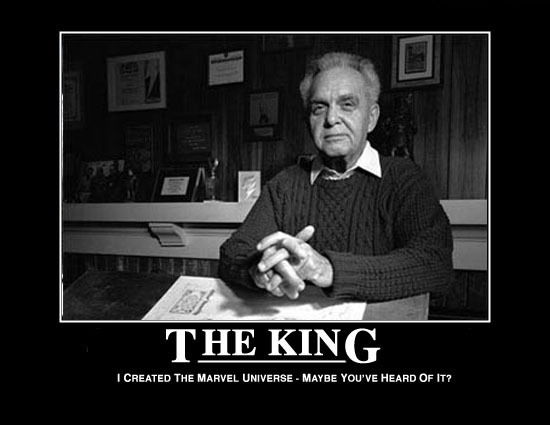 Comic books have left us a rich legacy of unforgettable heroes … and even in this golden age of superheroic film actors, directors, and special effects, Jack Kirby remains the biggest hero of them all! And since Jack would have turned 95 (!) on the 28th of this month, please view this video message from Jack’s granddaughter, Jillian, who will tell you how you can celebrate the King’s birthday and benefit The Hero Initiative at the same time! 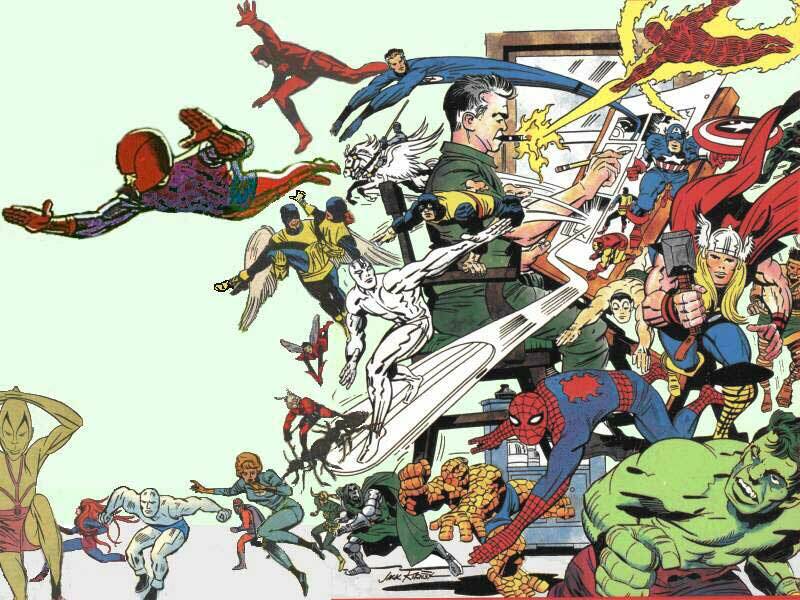 Give me your own Six Degrees of Jack Kirby (or pose a Six Degrees puzzle for us to deconstruct) in the comments section, below! NEXT WEDNESDAY: #63 Marvel Two-In-One Times One Hundred! Posted on August 22, 2012, in Other Media and tagged Chris Hemsworth, Jack Kirby, Kevin Bacon, Marvel Comics, Marvel Studios, Quentin Tarantino, Samuel L. Jackson. Bookmark the permalink. 16 Comments. I think it is significant that in the sixty-odd weeks I’ve been doing Longbox Graveyard I have only reviewed two or three series by Kirby … but “Jack Kirby” is still the second-most used tag in my metadata, right after “Marvel Comics” and just ahead of “Stan Lee.” Even when I’m not writing about Jack Kirby … I’m writing about Jack Kirby! He really does sit at the center of this subject. Well. Some astounding mental gymnastics (Did you pick up some moves watching Olympics? 😜 lol) on your part, P! Whew! Great read. Laugh out loud funny. Yeah it’s kind of silly but it is silly in a worthy cause. I wish I better appreciated Kirby during his lifetime — I guess I have the rest of my own lifetime to redress that oversight. Totally worthy! I wish I had paid more attention to him, too. Groovy cat. I love my Kirby, too … I have a review of his return to Captain America in 1976 coming up here at the blog in a couple weeks. Awesome piece. I’m going to forward this post to my young comic book reader friends just to show them what a true talent he was. Thanks! 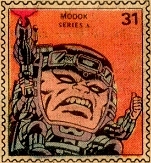 We can’t possibly celebrate King Kirby enough. In many ways he just gets better as the years go by.